Premium HD Tandem trailers are modifications of our Standard trailer. They feature a chassis designed to suit bigger loads, carry more weight, and add mobility to your transporting. The Premium HD Tandem carry loads of 2000kg respectively. The Premium series is built to last and comes with the optional extras toolbox storage, ladder racks, spare wheel, and wheel bracket. Select an option... 14″ Wheel No, thank you. Select an option... Yes, please. No, thank you. Select an option... Yes, please. ($300.00) No, thankyou. Select an option... 12 Months ($269.50) 06 Months I will source my own registration. In general, we recommend staying away from bolt together trailers. This does not say bolts are inherently inferior. We have just seen too many poor bolting applications. So we only provide fully weld trailer for Australia conditions. 1600mm long draw bar will provide best balance for your trailer. Rock N Rollers Spring:Best spring system for tandem axle trailers in Australia. All lighting is led and fitted inside a protective covering ensuring the lights are protected from damage. 8 inch jockey wheel mount on 100mm x 50mm x 1600mm RHS draw bar with manual hand brake. 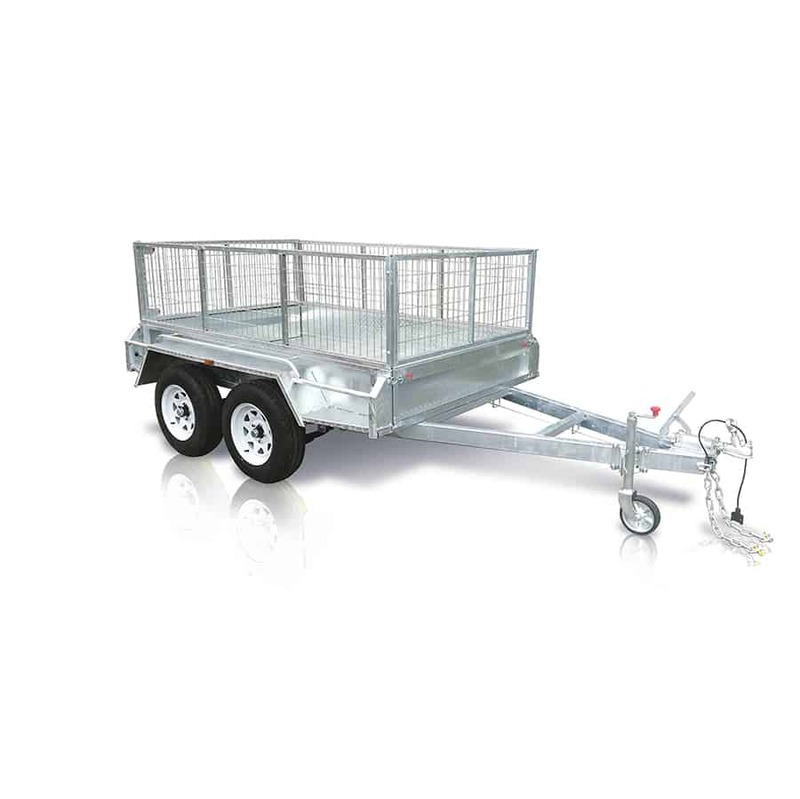 The Premium 8 x 5 HD Tandem trailer model gives you all the assurances of a Premium HD trailer, with straighter drives, better shock absorption, and better overall stability. With four tires you can trust your trailer to haul your load with minimal fuss! Dependable tying bars on three sides give your load added stability for travel. Alternatively, you can also choose to cage your trailer at 600mm or 900mm height, or have no cage at all! Your trailer cage is additional to the standard 300mm height of the box. This helps to distribute your load and share the strain more evenly. It goes a long way to keeping your Premium HD Tandem trailer in good condition for longer. A spare wheel, to go with your wheel brace, is also optional. Superior shock absorption gives you peace of mind that your load is secure in transit and will arrive safely. At Century Trailers we know that your loads are important, so we do not compromise on quality. Our exceptional staff is involved in the supply chain at the design, production, and assembly stages. 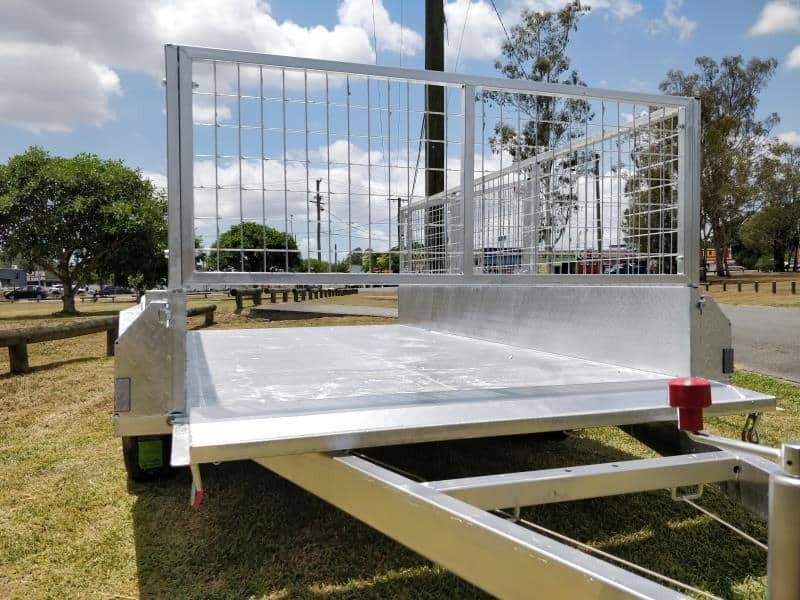 Century Trailers are made from quality Australian Standard components, using local plans, and exceeding local quality standards. Additionally, our trailers are tested against the cruelest Australian conditions. What’s more, you can be assured that your trailer will stay local for maintenance and repairs with our local maintenance and repair warehouse in Rocklea. 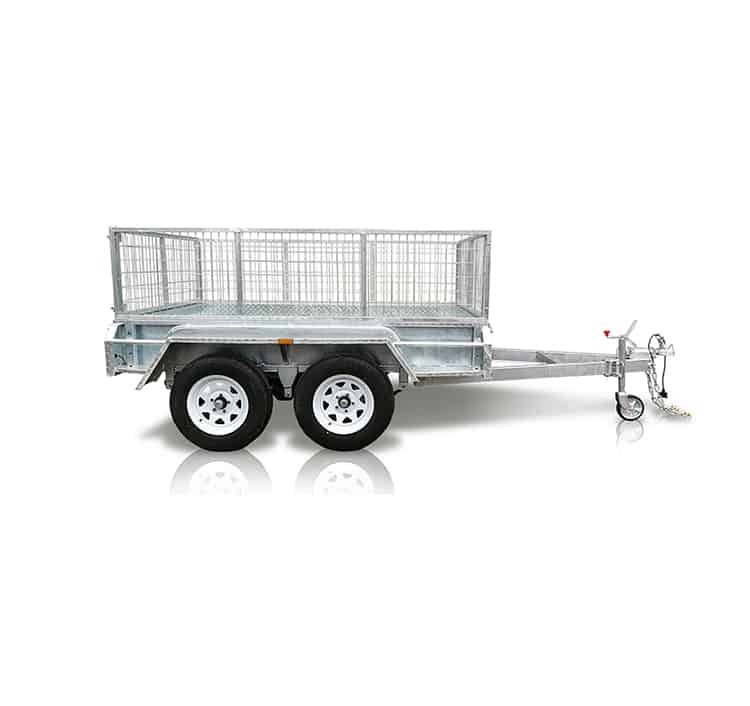 Our Premium 8 x 5 HD Tandem trailer is a reliable and durable model. Varied sizes and cage options mean you can modify your Premium HD Tandem trailer to suit your load requirements. Rest assured that your trailer can do the job – no matter the size!